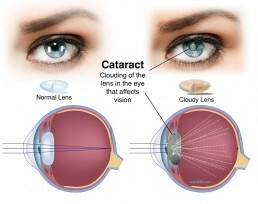 Cataract, clouding of the natural lens of the eye, is a normal feature of aging and is to some extent present in anyone over the age of 50 years. It’s progression is often a contributing cause of vision loss in patients suffering from other eye diseases of aging. At Vision Rejuvenation Victoria we no longer perform cataract or refractive lens exchange in house as it is no longer the main thrust of our medical work, but will arrange it for patients where it may be helpful in optimizing vision for our patients.